From the anonymity of the Barca boot room, suddenly all the pressure was on a 43-year-old man who had arguably only once come to the attention of the world’s media after being poked in the eye by Real Madrid coach Jose Mourinho during a Spanish SuperCup game in 2011. By accepting the Barca board’s offer of the job he was now responsible for managing arguably the most gifted squad in the world, while working under the relentless glare of an insatiable Catalan media as well as journalists from all over the planet. But the seamless transition - Barca have dropped just two points this season when they drew with Real in the Nou Camp - suggests Vilanova has picked up a thing or two about the art of football strategy and, perhaps equally importantly, the art of man management. As a youngster Vilanova was at Barcelona’s youth academy - La Masia - with Guardiola, though unlike the Catalan great he failed to graduate to the Barca first team. While Guardiola strutted imperiously around the Nou Camp and guided Barca to their first European Cup after the 1-0 over Sampdoria at Wembley in 1992, Vilanova was busy acquainting himself with the delights of Spanish football’s lesser known clubs - Figueras, Celta, Badajoz, Mallorca, Lleida, Elche and Gramenet, before retiring as a player in 2002. When Vilanova was appointed, Barca sporting director Andoni Zubizarreta argued it was "a logical decision" because he "represents the same style of play and the same philosophy." "Tito has been working here with us, so why not Tito? He puts in all the hours until he sleeps and he has the personality that we need to lift us. He's different to Pep, but Tito's the one," Zubizarreta said. "We've always looked in house. We have Tito – it's simple. We needn't go out on the market." The logic of the decision to resist appointing a big name coach - as Leeds United disastrously did in the 1970s when they brought in Brian Clough to succeed Don Revie - is beginning to look like a masterstroke. “At the beginning everybody had a lot of misgivings or doubts about his capacity to be a leader,” Catalunya Radio’s Ernest Macia told CNN. 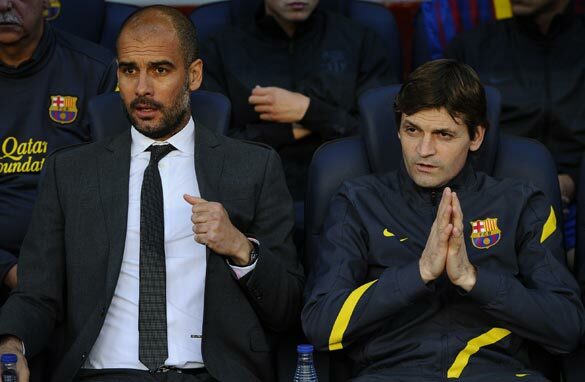 “The main difference between Pep and Vilanova is their character. Pep has a strong one and had a good reputation on motivational skills, which gave him a sort of ascendancy and command within the group. Macia argues that a health scare just over a year ago - Villanova underwent emergency surgery to remove a tumour on his parotid gland - has had a profound effect on the Barcelona coach. “He underwent a kind of ‘cancer' and seems to have gained perspective. It has given him cool, the tranquillity to take on some growing ‘conflicts' such as the size of Messi's ego. “Last year Messi didn't feel comfortable with some of the decisions Guardiola took (such as putting on Tello against Real Madrid in Camp Nou and other experiments, because Messi only wants to play with the best), and it wasn't unusual to see Messi shouting at youngsters. “Tactically there have been no changes. The team plays 4-3-3 or 3-4-3 depending on the context. Tactical switches are common, especially during Gerard Pique and Carles Puyol's absences. That's the reason why the team has conceded more goals than ever. “Tito keeps the same philosophy as Guardiola: with a smaller squad and all the players feel involved and are versatile to play in any position. “His easy-going character has allowed some key players such as Messi, David Villa or Dani Alves to feel important. What remains to be seen is how Vilanova will cope if Barca suffer a slump. For the time being though he can look back with some pride at a remarkable start to his tenure as Barcelona coach. If Barca’s motto is "more than a club," Vilanova is quietly building a reputation as more than a coach. Vilanova is currently proving to be among the best coaches around the globe. Don't forget he also play a as a youth at Barca academy. He will eventually prove that he is the best coach to succeed Guardiola. More strength to your elbow Vilanova. Barca fans around the world are behind you. Tito is trying.he wil definately make it. Let us sse these guys outside Barcelona. At some point last season Zubi said Barca's success was not down to Pep, he was right, just like the success with these players is not down to Tito. We will see them against the Germans in Europe, nobody seems to notice those guys yet. Anyone here for another record being broken, full unbeaten season at Liga? “His easy-going character has allowed some key players such as Messi, David Villa or Dani Alves to feel important." Well i don't think David Villa have felt important under Tito! Wishing Tito all the very best in the New Year. Barca 4 Life Miss Is The Man. It is not easy to manage barca as there are so many good players. This barca just needs to concentrate a little more on its defence and on finishing games, after that they will be unstoppable. This cnn world sports coverage is a bit of a joke , The six nations rugby tournament begins on saturday feb 2 yet no mention on cnn , not a word like it didn't exist. . Rugby is a big global sport now put the way cnn treats it is scandalous, They (cnn) seem more focused on celebrities and irrelevant sports like surfing or sailing than giving fair coverage to a major global sport such as rugby. This anti-rugby bias is simply not good enough.